Early in my stitching life I developed a passion for carnival masks. They captured my imagination along with the sense of mystery and the beauty they inspired in me. Imagine my joy when I found a hand painted carnival mask by Lee. That one mask sent me on a journey to find as many masks to stitch as possible. By the time I was finished I had stitched 6 of them. Each morning as I awake I look around my room and see them all; to this day they give me pleasure and satisfaction. Subsequently I have stitched an array of carousel horses, teapots, and a host of Seattle Seahawk gewgaws. Do you have a passion for something, like carnival masks or bunny rabbits, or maybe a sports team? Have you ever seen a photograph, a graphic design or something else and thought “I’d like to stitch that… I wonder if there’s a canvas of it somewhere or I wonder if I could create one?” If you have, do I have an opportunity for you! On November 3rd and 4th you will have a chance to learn how to create a hand painted canvas from JP Sligh of Labors of Love who has spent 35 years putting his art on canvas. In this 3-hour class you’ll learn how to create a stencil and transfer it to canvas as we create a sunflower design. You’ll work with basic, metallic, and glitter paints as JP imparts his methods, insights, tried and true techniques and secrets that will teach you how to make your own visions bloom. 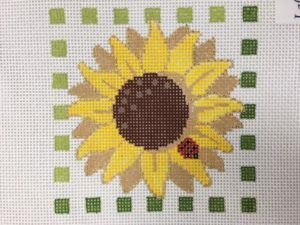 The class includes all the materials required to create the class canvas, and if you wish you can purchase a stitch guide and threads to finish the hand painted sunflower you create in class. I hope you join me in this class! In the end you’ll have a new appreciation for how stitch painted designs come to life—and you’ll leave with your very own creation. 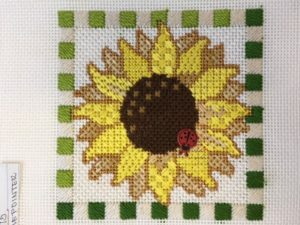 After this class I look forward to seeing what you love to stitch as you create your new design and I will share mine as well! See you in November.